As a trustee of The SMA Trust, I am kicking off the MAD Challenge by committing to a 75-mile walk with the rest of the family around North Yorkshire, ending up in our family birthplace of Pickering. 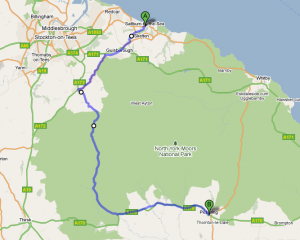 During the Easter holiday 2011 we will be setting off from Saltburn on the coast and skirting around the west side of the North Yorkshire Moors to follow parts of the Cleveland Way, via Helmsley to Pickering. This will be over three or four days and we will be joined for part of the way by Marni Smyth, our SMA ambassador, who has set the challenge – in her words “well if I can do part of the route, how about you finishing it?” I think it’s a pretty fair challenge, considering Marni has type 2 SMA and will be doing her bit in a powered wheelchair! We are keen to do this as it is ten years since our son Harry died – he was partly the inspiration for The SMA Trust and therefore this walk will be in his name.